The Whitelock Community Farm and "South Lots" as of July 1, 2015. There is still work to be done, but we have come along way from the vacant lots that lined the street for more than 15 years. Soon grass will be growing in the circle area of the South Lots, and residents will gather for community events! FOR THE MOST RECENT NEWS ON THE SOUTH LOTS, VISIT OUR PROJECT UPDATES BLOG! 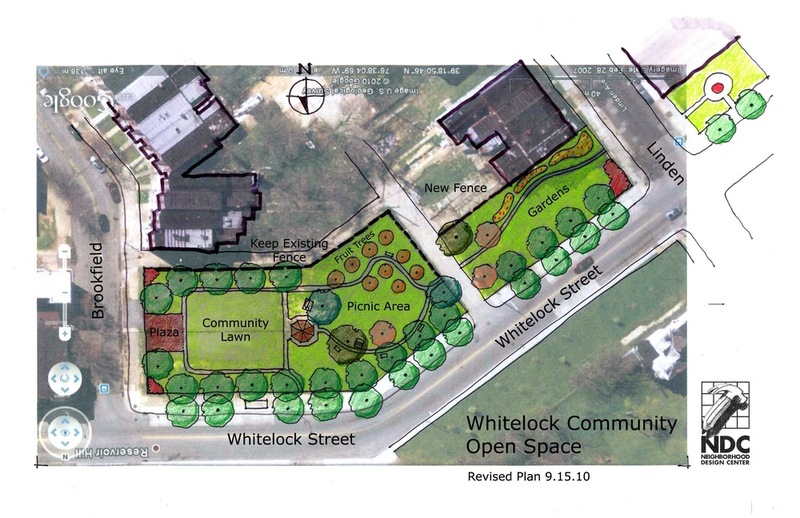 The largest contiguous group of vacant lots on Whitelock St. is on the south side of the 900 block. RHIC is currently coordinating the restoration of the South Lots into a multi-use green space through community visioning sessions and funding from Healthy Neighborhoods, Inc. RHIC attempts to use the place-making techniques taught by the Project for Public Spaces to encourage the people who will use the site to design it as well. In 2011-2012, we partnered with Neighborhood Design Center (NDC) to work with local landscape architects and designers to refine neighbors' ideas for how to make the site a comfortable and inviting place to host community events. The most popular suggestions usually involved outdoor movie nights, neighborhood flea markets, Christmas tree sales, as well as unorganized play events. We also planted street trees, removed the perimeter fence, and began to excavate the debris left over from the City's demolition of the original buildings in 1994. By basing the design and execution of the new community space in the collective vision of residents. RHIC seeks to transform this plot into an attractive, active, multipurpose green space that is both conceived and maintained by the neighborhood. 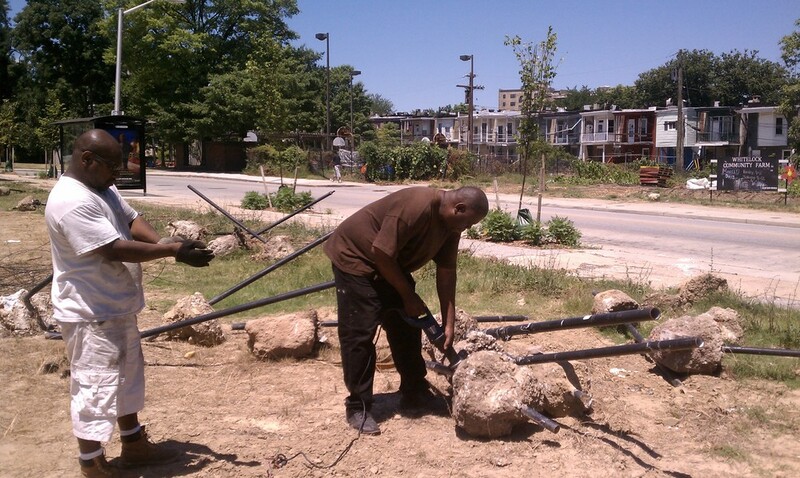 In 2012, with support from Healthy Neighborhoods, Inc., more than 90 people have helped haul debris, build berms, and design the site plan for the South Lots project. We estimate that nearly 1,000 volunteer hours have gone into the project in just the past year. In 2013-14, we've continued to work with NDC to update our plans, including an additional growing space for the Farm on the western side of the site. We've laid pathways and started to install park features, including seating and plantings. We've also built seating benches out of granite that we dug out of the original site.